The Trustworthy Accountability Group (TAG) was thrust into the limelight when P&G required digital inventory to be TAG certified. But what exactly is TAG and what do they do to determine good inventory? TAG was created by the major acronyms in media - the IAB, the 4As (American Association of Advertising Agencies), and the ANA (Association of National Advertisers). It is specifically tasked with eliminating fraud, combatting malware, fighting internet piracy, and promoting transparency. It is run through a board of directors that is nearly 30 leaders in the industry, including Marc Pritchard (CMO at P&G), Neal Mohan (former head of advertising at Google) and Rob Norman (Chief Digital Officer at GroupM). The board provides strategic direction to the day-to-day execution part of the business. As discussed above, there are four goals of TAG. The first is eliminating fraud. 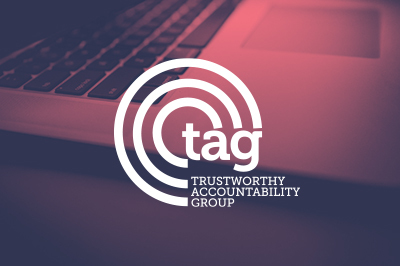 TAG has created a Certified Against Fraud program that compliant companies can use to show they meet the program's requirements. Entities can self-certify by attesting that they meet the requirements of the program, or they can have independent verification through an external entity like a law or consulting firm. The actual requirements depend on the company's role, but they include implementing the Payment ID Protocol (ensuring payments are made only to legitimate entities), employing a data center IP blacklist, complying with MRC IVT guidelines, etc. To meet the MRC IVT guidelines, however, one must comply with of the following: 1) be an MRC accredited certified against fraud vendor or be certified by an independent auditor, 2) employ an MRC accredited certified against fraud vendor on all inventory, or 3) use an ad server that meets either of the above requirements. This adds material costs to the TAG program's compliance given that very few companies meet the MRC certification requirements. The Certified Against Malware program is another seal companies can earn for showing compliance. Just like the fraud program, participants in the malware program can self-certify or use a third party, and applies to buyers, sellers, intermediaries, and vendors (e.g. creative scanning / verification companies). Certification requires scanning a "reasonable percentage" of creative inventory, establishing formal post-mortem processes for all malware, and conducting semi-annual reviews of all post-mortems. The principles of certified against malware require that each entity take responsibility for what they send one hop up the supply chain - meaning companies cannot take the position that they're self-service and avoid responsibility. Similarly, companies are responsible for knowing the trustworthiness of their buying partners. The Certified Against Piracy program focuses on identifying sites the facilitate the distribution of pirated content and counterfeit products, and enables marketers to avoid these sites. TAG makes available a pledge that agencies and brands can take that certifies its efforts to minimize the placement of ads on illicit sites. This involves the use of Digital Advertising Assurance Providers (DAAPs). To be a DAAP, a company must provide the tools to limit their exposure to undesirable websites or other properties based on a set of criteria that TAG has provided. It appears that the Certified Against Piracy working group, which runs the program, is on hold - thus there is no active development here. Transparency is the final focus area of TAG. This focuses on building trust, transparency and accountability through the digital supply chain that recognize honest players and combat illegal ones. TAG has created the TAG Registry, which maps a company - that has had a background check performed by TAG - with an ID number that clearly indicates that company. In the future, TAG hopes to create a payment ID system that ensures that money meant for a company indicated by an ID actually goes to that company. TAG has a broad mandate, but it is actually taking concrete and reasonable steps to get there. To move the industry forward, it is taking incremental steps in the right direction that do not upend existing businesses or create onerous new requirements. In conjunction with broad mandates through major buyers like P&G, it's very possible that TAG will actually make a difference.